If you were to take a survey of your current employees, would you find that you've hired people from all walks of life? Some companies aren't aware of bias in their recruitment and hiring of employees. Implicit bias is, by its very definition, unconscious. When companies are biased in their hiring, without being conscious of it, how can the challenge be resolved? Is there a way to reduce bias during the hiring process? Can background checks reduce bias in hiring and recruiting of employees? How are Hiring Managers Biased? Looking to hire someone similar to themselves or someone else within the organization - This "similarity attraction" bias naturally occurs by assuming that only one type of person is right for the job. Making assumptions - These assumptions lead to what's called "confirmation bias". When making an assumption of someone based on their outward appearance, the school they attended, or any other stereotypes, the next step is to look for ways of confirming this information to be true. An interviewer may approach questions differently, a resume may be overlooked, or a qualified candidate may be dismissed from the hiring pool. Going on gut instinct - When a recruiter or hiring manager relies on gut instinct, they are unaware of the unconscious biases that may be affecting their decision. Once the instinctual desire to hire or not hire takes over, no other objective information will be considered. Be aware of job descriptions including language that may unintentionally discriminate. Blind resume screening, including removing the names of the applicant, may reveal potential qualified candidates that may have otherwise been overlooked. Expand sources for hiring to include a pool of candidates that hadn't been considered before. Structure interviews so that every candidate is asked the same standardized group of questions related to the job. Measure and survey to identify potential bias of applicants and employees. Set and track diversity goals within your organization. The Fair Credit Reporting Act reduces some of the potential of bias by allowing the applicant to dispute inaccurate or untrue data on its background reports. 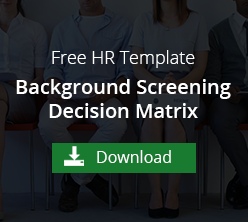 An employers cannot legally dismiss an applicant from the hiring pool, whose background check reveals information that isn't true, until the applicant is aware they are being screened and the information could be used against them during the hiring process. Employers must also be aware of inconsistent decision making when considering an applicant with a criminal history. The EEOC could still consider hiring some applicants but not others as a Title VII discrimination unless the employer has a job-related background screening policy and criminal background decision matrix to back up their decisions. Bias during the hiring process can not only cause the right person to be overlooked for a job but also the wrong person may be assumed to be a good fit when the job doesn't play to their strengths. Employers are also subject to discrimination lawsuits if it is revealed that their employees are not relative to the diversity of the area. In order to reduce the likelihood of bias, start talking about it and take a hard look at current hiring practices. If you have any questions or need assistance in standardizing your screening policy, contact VeriFirst.